After our warm up exercise we got to get started on a couple of goals for 2013. These goals are in the flowers at the bottom of the page. We were also instructed to write down what we are grateful in our lives right now as to live in abundance. The point is not to get caught up in the future and forget to live for and enjoy today. The vehicle symbolizes moving ahead in the year (the road) driving towards the sun (light) with your purpose. While working on this page, I saw that my goals for the New Year are much the same as the last. I saw that this year will be about forging ahead and living in even more balance with peace of mind. My realization was that sometimes we don’t need to completely feel like we are starting from scratch. A good plan happens to still be a good plan, and I’m sticking with it! 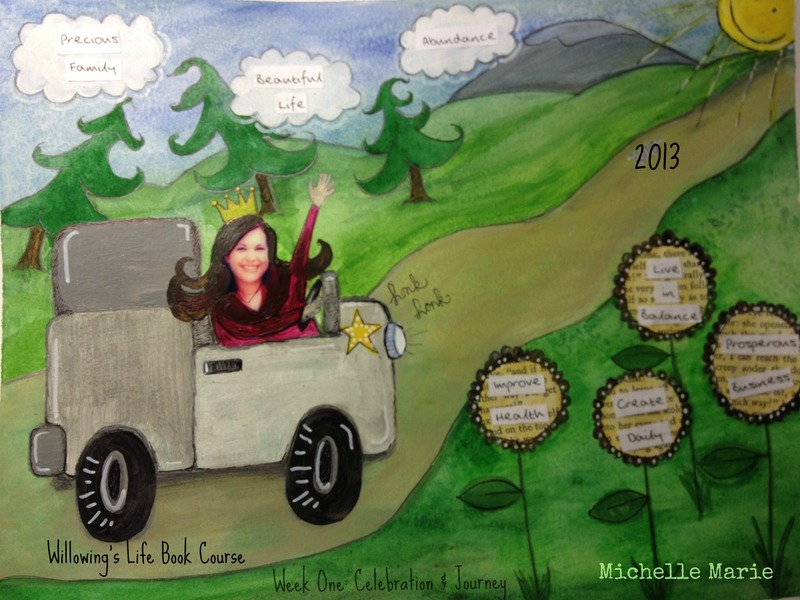 This entry was posted in Lifebook Projects and tagged arts, creativity, goals, gratitude, journaling, mixed media. Bookmark the permalink. I love your Journey! You look so happy. I’m going to start mine tonight. I felt drawn to the doll exercise instead. Thank you for sharing your art! and your journey! Is there by any chance a magical city at the end of this journey? A place where anyone can find what they treasure most? I suspect there is more to your crown than meets the eye: perhaps powers to ward off naysayers and other evil nemesis. Is there a little dog too? Perhaps a strange cat with a great big grin that loves to give advice? Or, a Caterpillar that changes seekers into butterflies when he’s satisfied they know who they really are? Maybe an Inn where fellow travelers tell their tales? Or, a way station called Courage for those finding themselves weak at heart? Will there be knights of honor and seekers of truth? But then really, don’t tell me, or what would be the point of the journey. You got my imagination going, Garry. What fun!